Looking to up your vocal game with a reflection filter? We've found the best options on the market and reviewed them for your pleasure. 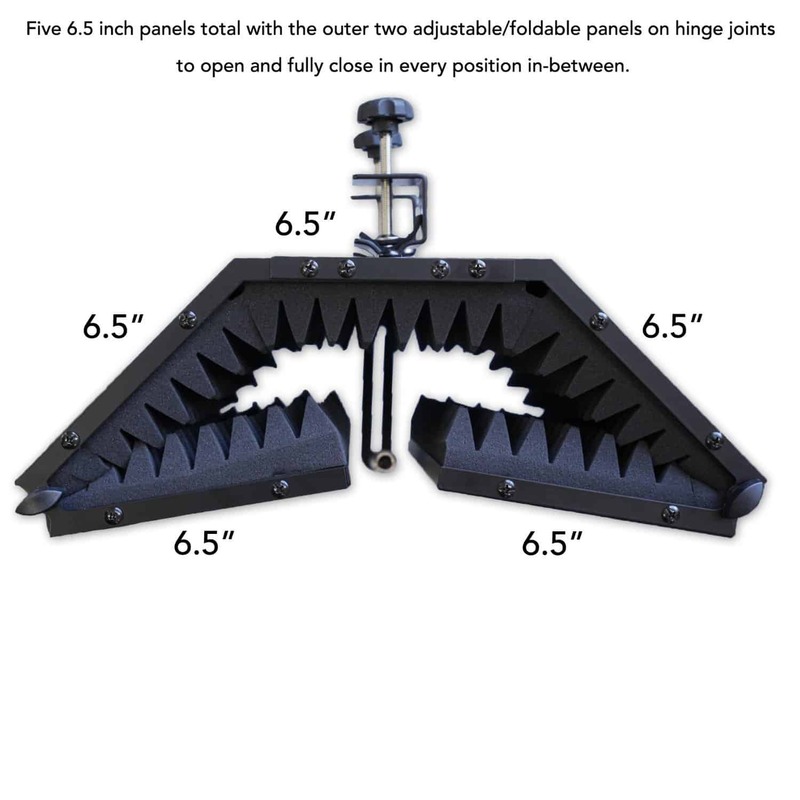 Using an acoustic shield can help tighten up your sound if you are in an untreated room. 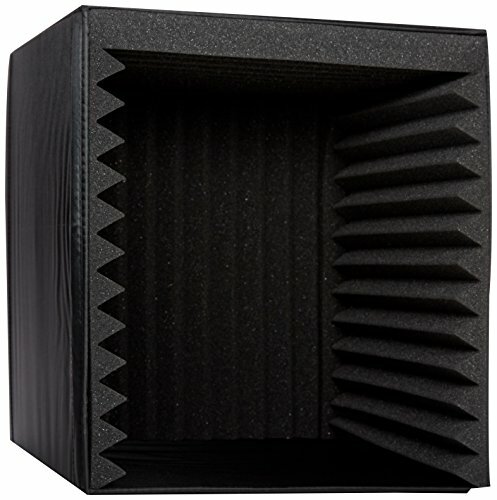 Rather than spending thousands of dollars treating your room you can use a reflection filter to mimic the sound quality of professional studios. ​While it won't necessarily improve the actually audio quality of your recording, the overall sound will be much cleaner. The unwanted ambiance created by the acoustic reflection of your surroundings can have subtle, but noticeable, effects on your recording sound. 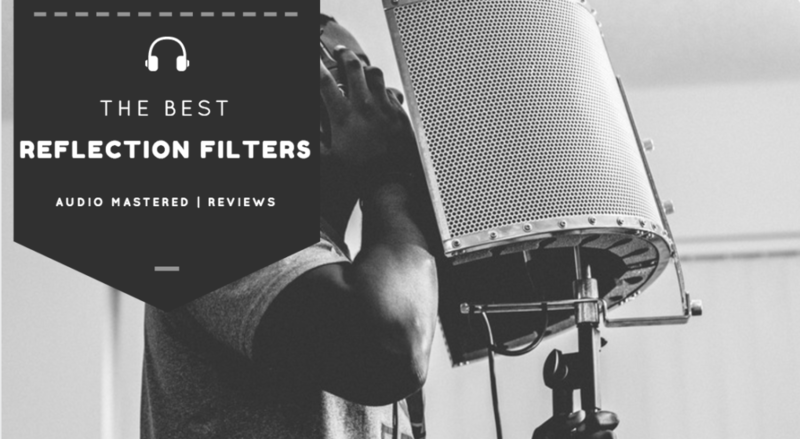 Whether you are a voice-over actor, podcast producer, or vocalist, you can benefit from a good reflection filter. There are a number of options available on todays market. We like to keep it simple and break things down into a few categories. Getting answers to these questions will provide you with a great guide to selecting your reflection filter. Let's get started. Your first consideration should be if you are going to be using with a mic stand or on your desktop. Some options will only be compatible with one style of recording, while others will provide you with both. The weight of the shield is very important. If you're purchasing a shield around the 10 pound mark you will need a heavy speaker stand to prevent it from tipping over. This can potentially add another $40-70 to your purchasing price. However, these heavy stands usually have the option of being used as desktop filters. 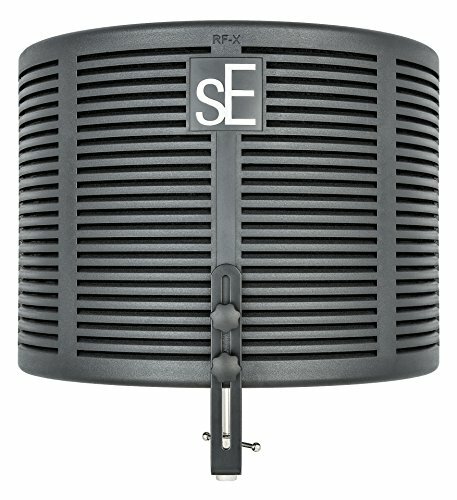 The lighter (5 lbs) filters can be used on any mic stand. You must be able to adjust the mic position in reference to the isolation shield. A few reflection filters will allow you to adjust the angles of the outside panels. This adjustment will also come in handy when you want to store your filter. 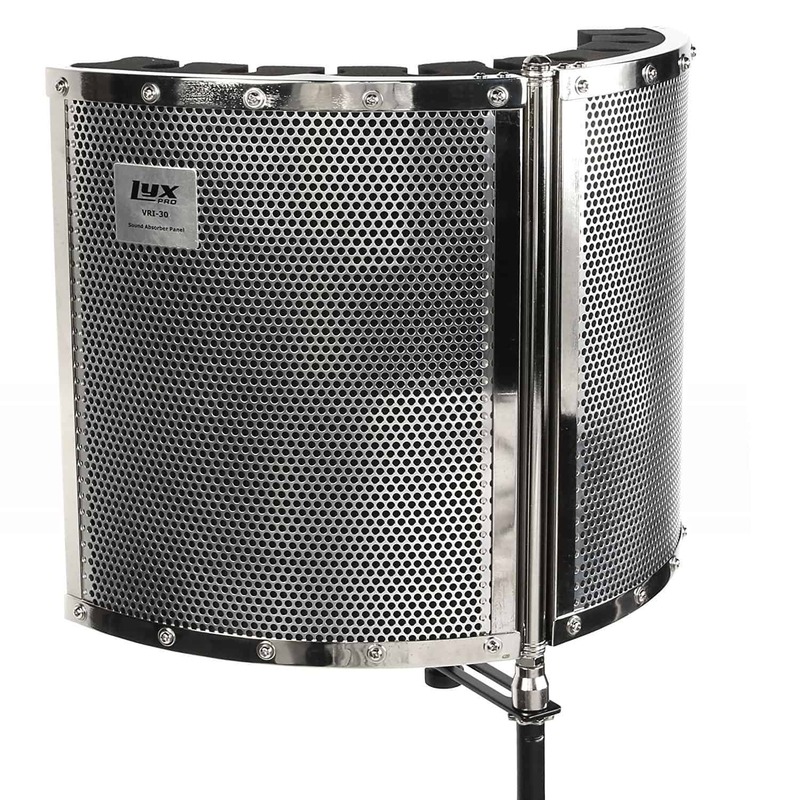 These acoustic filters can be quite large so pay close attention to the dimensions if you are planning on transporting them. Will you be using it on your desktop or standing up? Is the weight around 10 lbs? If so, you will need a heavy speaker mic stand. You must be able to adjust the position of the mic with reference to the filter. Below you will find our top picks for the best reflection filters. They are ordered by price. The only box-style reflection guard on our list. 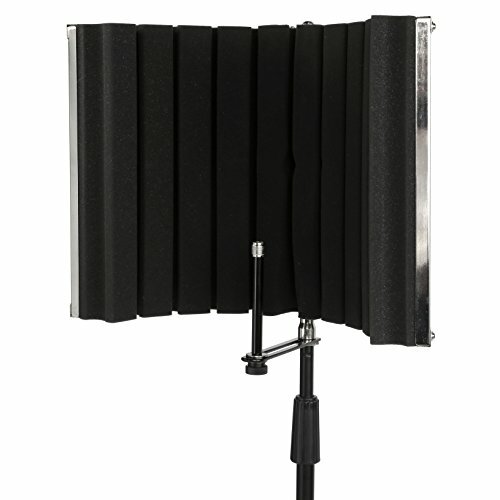 The Pyle PSIB27 is a budget friendly desktop reflection filter. 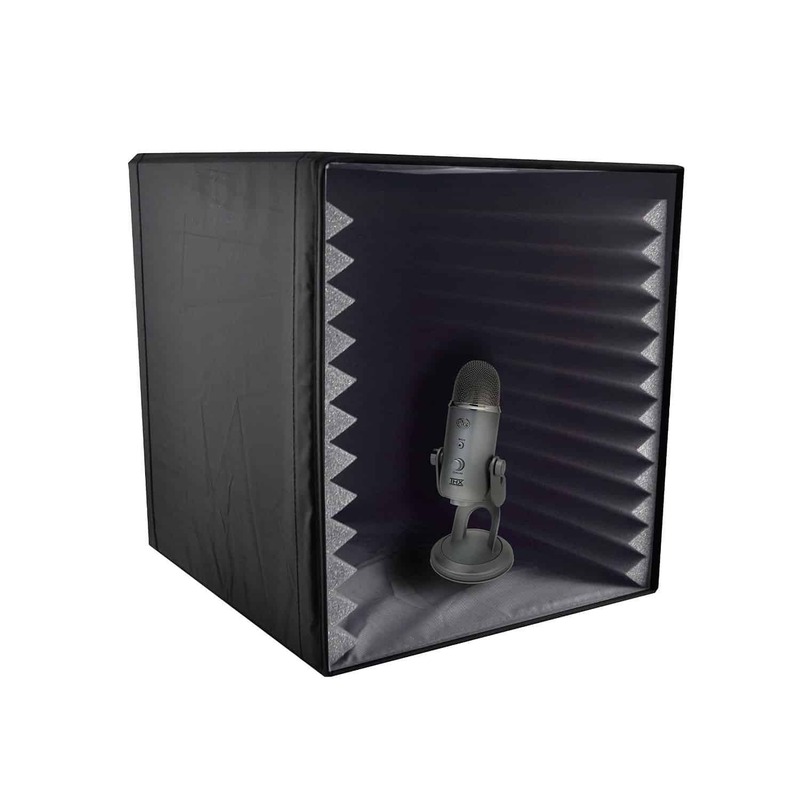 It's quick to set-up, lightweight and prevents any unwanted sound from contaminating your recording. You're going to need a mic with a stand to use this filter. 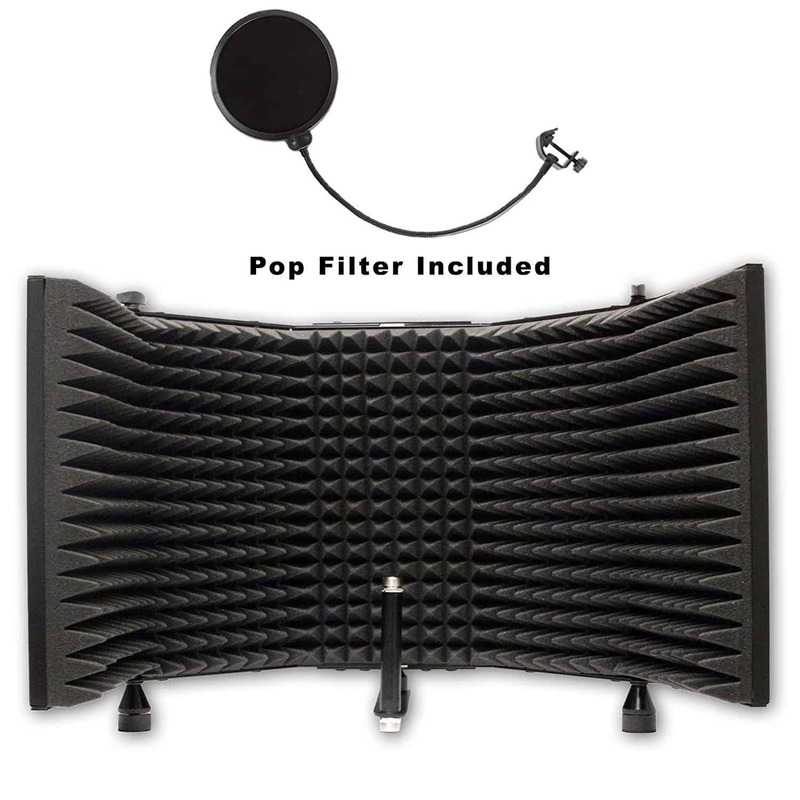 If you own a Blue Yeti, this will be a perfect addition to filter out any noise or interference. Keep in mind that the box isn't huge. You're mic and stand will need to be less that 13.3'' tall to fit. Good budget option for mics with a desktop stand. ​You might need to raise it up on a platform to get it to your vocal level. Bottom Line: Good for mics with desktop stand. 19.25" x 12" x 3.5"
The second on our list: the LyxPro VRI-30. This is great if you are accustom to using a mic stand for your recordings. Unfortunately, you are not going to be able to place this on your desktop if you have a desktop microphone. The overall functionality of the isolation shield is great. 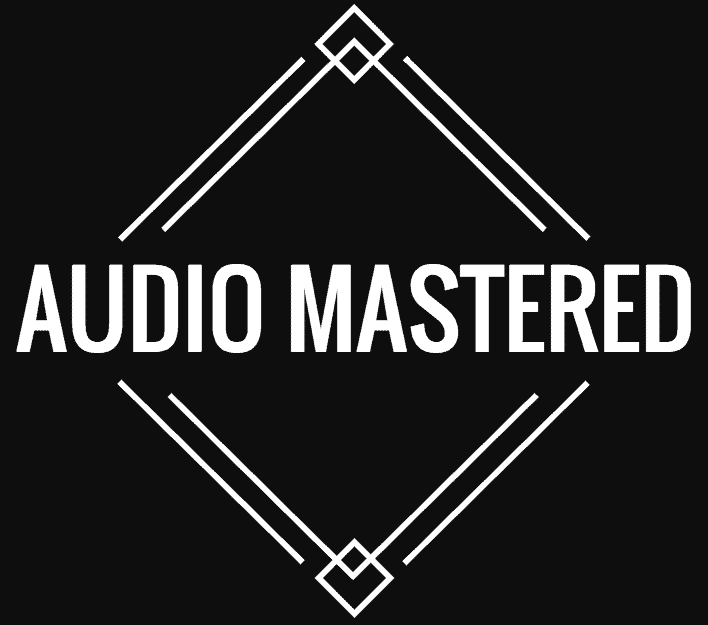 Everyone who uses it notices a significant increase in the quality of their recording. It comes in three flavours: mini, small, standard and upgraded. If you want to use a overhead mic you'll want to consider the upgraded version (also available on Amazon). The durability of the materials is quite good. On the back you have perforated aluminum with high density EVA foam in the front. You will need to disassemble the entire product every time you want to travel. This can be a pain if you plan on moving around. A great option for those who like to record standing up. At only 3.8 lbs, this is one of the lightest options on our list. Bottom Line: Use a mic stand? This is a good option. Uses high quality material and is adjustable. A great option. The AxcessAbles SF-101 is a budget friendly versatile stand. It offers the most adjustability of all the reflection filters on our list. It uses 2 inch think high-density sharp foam for acoustic absorption. We like that you are able to use it as both a desktop and a mic reflection shield. As with a lot of absorption shields, it's going to take up a large footprint on your desktop - ensure you have enough room. If you prefer to stand while recording, or want to put it on a mic stand, you are going to need to have a heavy speaker stand. A regular mic stand will not be able to hold up the 10 lbs. Similar to other filters, you are able to adjust the location of the mic in reference to the shield itself. 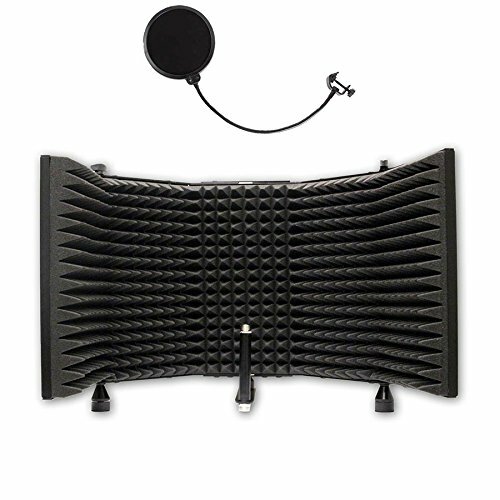 It also comes with a bonus pop filter, a nice thing to have if you haven't already purchased one. Very adjustable. Performs well. Requires a heavy speaker stand. Bottom Line: Recommended. Provides some of the best adjustability on the market. Remember, you will need a heavy speaker stand if you plan on using a mic stand. 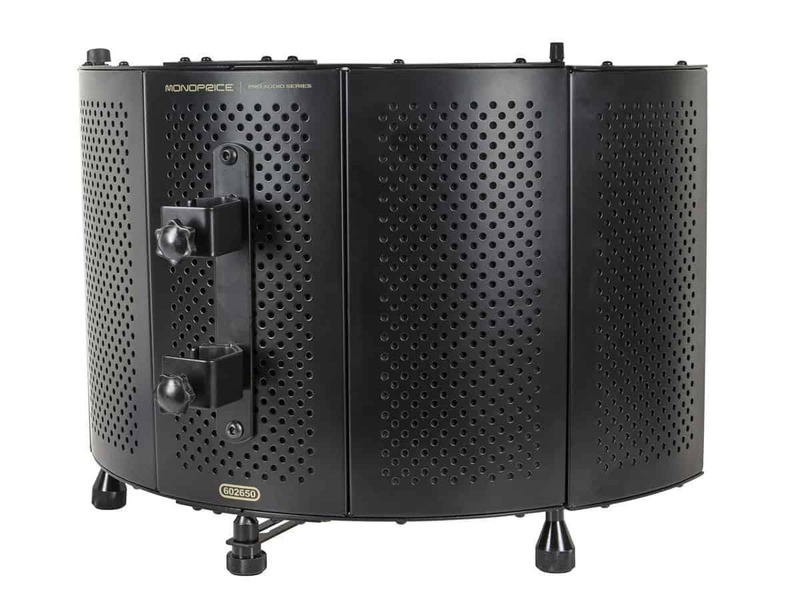 This is our favourite on the list: the Monoprice 602650 Microphone Isolation Shield. It performs well on all fronts. 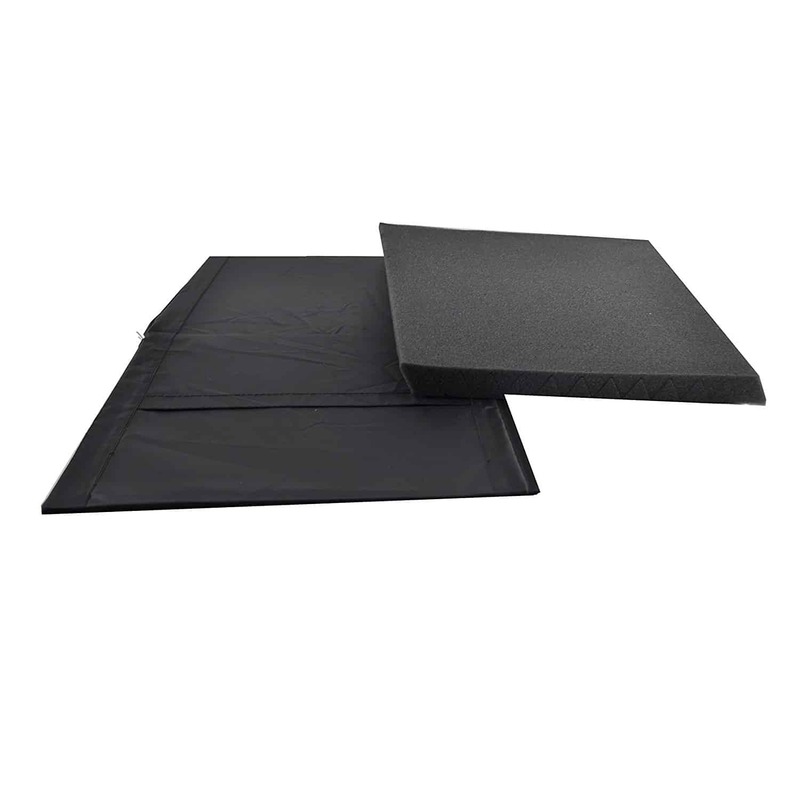 The acoustic shielding is top notch in addition to the durable build quality and professional look. It gives you many options for adjustments regarding mic location and shield orientation. It uses high-density sharp acoustic foam for the noise and interference protection. The built quality is fantastic. The shield feels very well made, similar to those three times the price. It has a very professional look, making the value for money exceptional. Similar to the AxcessAbles SF-101, you'll want to be careful mounting this on a regular mic stand as it is heavy. You'll preferably want to use a heavy speaker stand to prevent it from tipping over. You are able to use it on your desktop if you have room. It also allows you to fold it up and put it away for storage when not in use. The best of the bunch. Great all around. The only thing we would like to see is the inclusion of a thread adaptor for smaller microphones. However, this is a small issue. Bottom Line: The best of the best. Highly recommended. The most expensive option on our list. 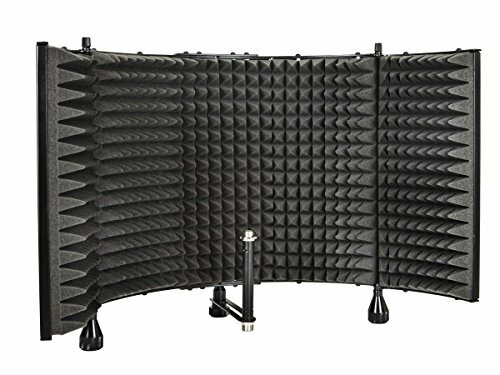 The RF-X SE Electronics Portable Vocal Booth uses a four layer acoustic filter to provide the maximum reduction in noise and interference. It's very lightweight and can be used with any mic stand. However, it cannot be used as a desktop filter. We are hesitant to recommend this option as it is an additional $30 compared to the other options. If you only have a regular mic stand, we recommend going with the LyxPro VRI-30 as it will give you the same results for $30 less. It does use a unique multi-layered acoustic design. Combining foam, air and an acoustic backing to get the most acoustic shielding possible. If you are willing to pay a little more to test it out then we'd recommend you give it a try. Lightweight. 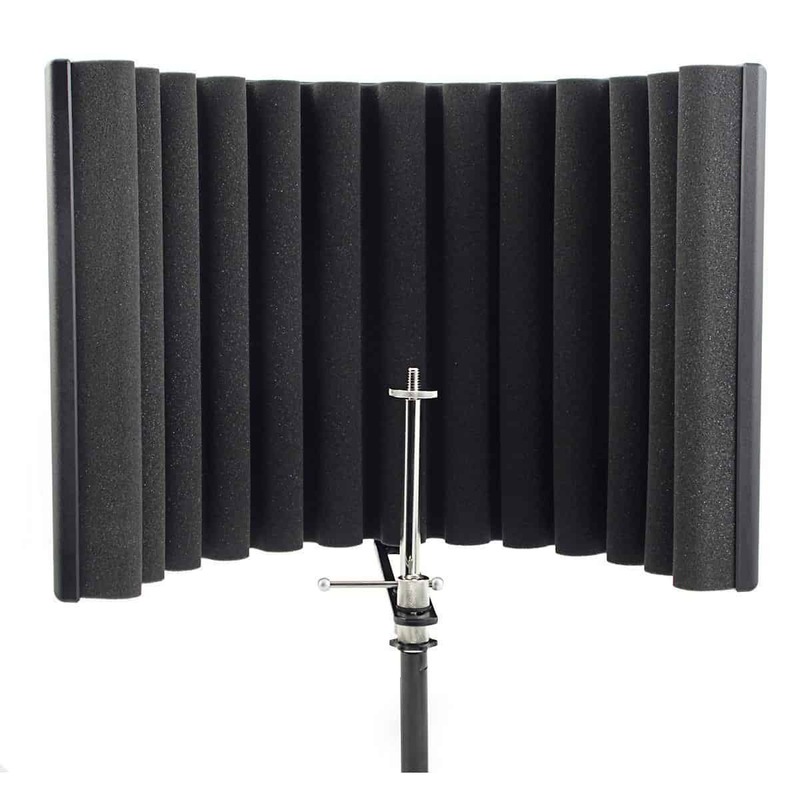 Great for those who want to use a mic stand and are willing to pay a little more to get the most noise reduction. Bottom Line: The most expensive option. Uses a 4 layer acoustic treatment. We still recommend the LyxPro VRI-30 if you are looking for a filter to use with a regular mic stand.